Shopping for Saturday Night Live Action Figures? Units found! New warehouse find. Who needs the news when you can just watch the “Weekend Update”? First ever figures of the Saturday Night Live “Weekend Update” news crew! Limited edition and individually numbered set also includes a fold out diorama of the "Weekend Update" news desk set! Warehouse find - limited quanities available! Entertainment Earth Convention Exclusive! Everyone knows the most entertaining news comes from Saturday Night Live, and now Bif Bang Pow! is bringing you the hosts from televisions funniest news broadcast in action figure form! 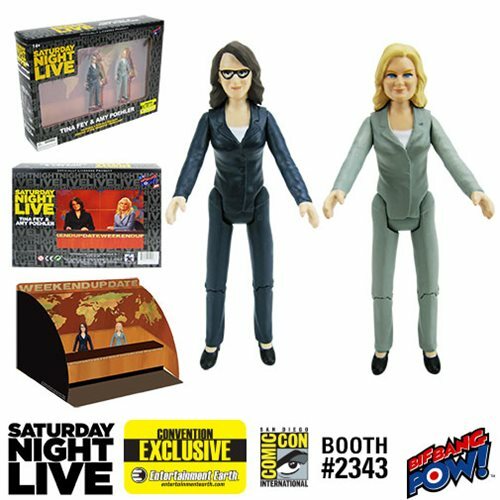 With this convention exclusive, collectors get detailed likenesses of both Tina Fey and Amy Poehler in this limited edition 3 1/2-inch action figure set! Both SNL funny ladies are professionally dressed and ready to deliver the news with the included fold out diorama set of the iconic "Weekend Update" news desk. The individually numbered set is limited to just 2,400 pieces so this set won’t stay in the headlines for long! NOTE: Thank you for the amazing response to this item! This particular version - the San Diego Comic-Con 2015 limited edition exclusive version - is SOLD OUT, but we are continuing to take orders for this item because a non-exclusive unlimited version will be made available to everyone who doesn't receive the Convention version. More information about this second version will be made available soon. This item will first be sold at San Diego Comic-Con 2015 at the Entertainment Earth Booth #2343. Because only 2400 units are being made, we do not anticipate ANY supply to be remaining after the show. Regardless, we are planning on filling all orders, but most likely orders placed online here will receive the non-limited version.